PLEASE STATE NUMBER OF ADULTS. NUMBER OF CHILDREN AND THEIR AGES ON ENQUIRY FORM. THANKYOU. Set in a lovely, quiet location on Greenacres Holiday Park with very little to no through traffic, our beautiful holiday home is available to hire for families. Our van is 2018 model, double glazed, centrally heated, with a piped gas supply and own parking bay. 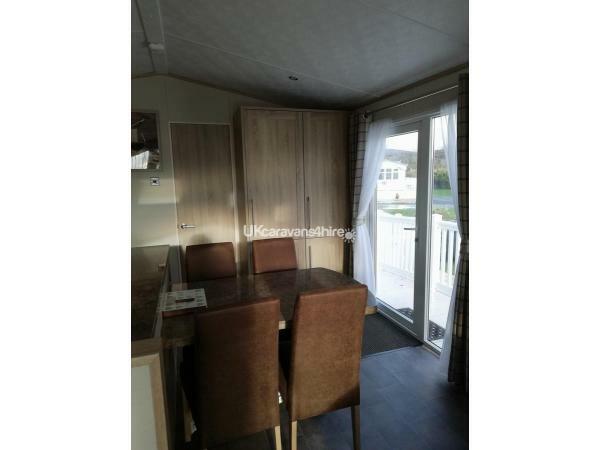 Our caravan has a gated side veranda leading to spacious front veranda area with full table/ chairs and parasol set plus a storage bench seat. The lounge is fully equipped with large flat screen TV, DVD player and DVDs for holidaymakers use. We also have a digital radio available to use. Very comfortable large 2 seater settee, armchair and high back chair for relaxing of an evening. The lounge area is heated by both a central heating radiator and an electric log burning stove effect fire. Large aspect windows with patio doors leading to spacious front veranda area. There is NO pull out bed in lounge area. The spacious kitchen area comes fully equipped with all you could expect plus more. A gas hob and oven, extractor fan, microwave, full size fridge freezer, dishwasher, toaster and kettle, plus slow cooker, sandwich toastie maker and iron and ironing board all there for your use! The kitchen has dinette area with table and 4 freestanding chairs. 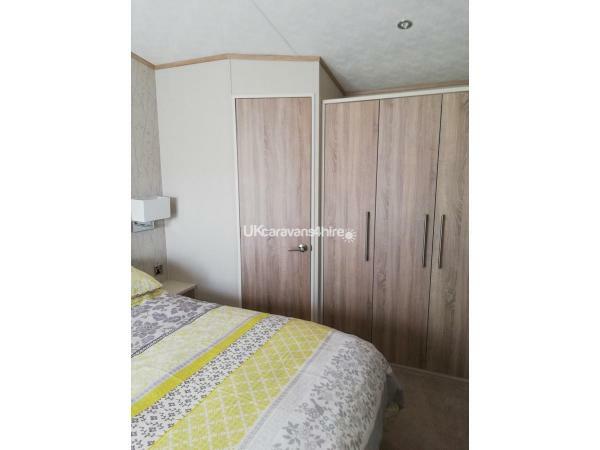 We have two separate toilets within the caravan, one consisting of toilet and basin which is the ensuite to master bedroom and one forms part of the bathroom consisting also of basin and shower with large cubicle. We have two bedroims. The single bedroom consists of two single beds side by side with a bedside cabinet and reading lamp. It also has a wall mounted, flat screen, 19 inch TV / DVD player. A wall mounted mirror, a wardrobe with 2 drawers. Holidaymakers are required to bring their own sheets / duvet covers / pillowcases (1 kingsize and 2 singles), tea towels and towels. We supply 1 kingsize duvet and 2 single duvet and pillows. Our mattresses and pillows are covered by quilted and waterproof protectors which are changed or laundered regularly. FUNWORKS PASSES ARE NOT INCLUDED IN THIS PRICE, THEY CAN BE PREBOOKED BY CONTACTING GREENACRES DIRECTLY. Caravan can be accessed on day of arrival from 2.30pm, caravan must be vacated by 10am on day of departure. Week long bookings are from Friday- Friday or Monday- Monday. We also offer midweek bookings of Monday- Friday (4 nights) or weekends of Friday- Monday (3nights). Prices shown are for 3 and 4 night bookings, If you would like a weeks stay please contact me for a price. Deposit of 20% of holiday price required upon booking with balance to be paid no later than 4 weeks prior to first day of holiday. A £75.00 security deposit is also required, payable same time as final payment. This is to cover any damage, breakages, extra cleaning costs or loss of keys. This payment will be returned to you after your holiday when caravan has been checked. Please leave the caravan clean and tidy upon departure. We advise guests to take holiday cover / insurance as monies once paid cannot be refunded. In the event of late bookings being required, monies must be paid in full at time of booking. Wherever possible we would prefer 2 weeks notice of booking to ensure your holiday runs smoothly. Thank you for taking time to submit a review. I am pleased you enjoyed your stay and look forward to you returning in the future. Just returned from a fabulous holiday. The caravan was beautiful and immaculate with everything you could possibly need for a self catering holiday. Booking was made easy and any queries were promptly answered. We would love to return and would definately recommend this caravan. Thank you Angie! Thank you for taking time to submit a review. We are so pleased you enjoyed your holiday and you were happy with the accommodation. Thanks for taking the time to send a review. I am pleased you enjoyed your stay. Happy to have you return in the future. A beautiful and immaculate caravan, with everything you could possibly need for a very enjoyable stay in a lovely location. We have stayed at many caravans renting through haven, and private and this has to be the best we have ever stayed in. Thank you for sharing your beautiful caravan with us it truly made are holiday. Glad you enjoyed your stay at Greenacres. Thank you for your lovely review. Just returned from an excellent stay at this lovely caravan. The van is in a nice quiet location is extremely comfortable and very well equipped. Would definitely recommend. Thank you for taking time to give a review. I am pleased you enjoyed your stay and were happy with accommodation. 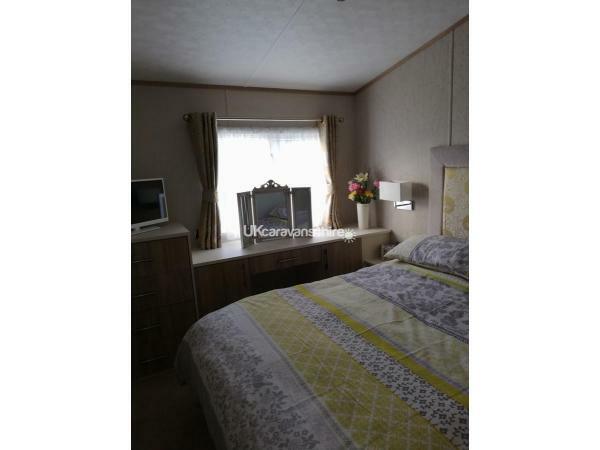 What a beautiful caravan with everything you need , lovely spot on the site . Thank you for your positive feedback. I am pleased you were happy with accommodation, and you enjoyed your time at Greenacres. Loved our stay in this caravan, it was modern and very clean. The caravan had everything we needed the bed guards gave us peace of mind for our 3 year old and the travel cot was in great condition. My son loved that he had a TV and dvd player in his room and they loved playing with the board games and also loved the decking area. The caravan is situated in a lovely spot not far from the beach. 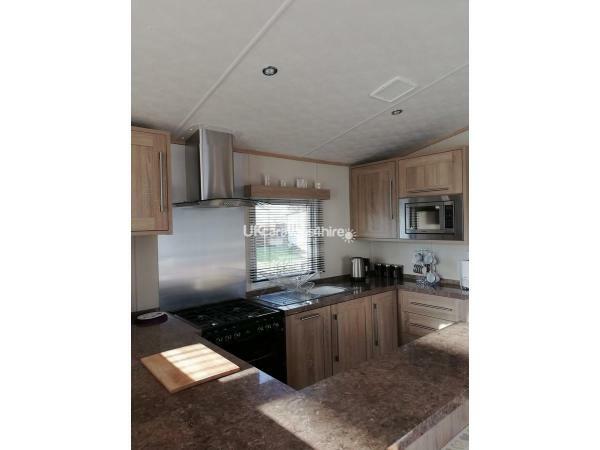 We highly recommend this caravan we absolutely could not fault it and we hope to go back. Pleased that you enjoyed your holiday and that you were happy with our caravan. Thankyou for the lovely comments on the accommodation. Would be lovely to have you make a return visit in the future. WE HAD A LOVELY STAY IN GREENACRES. 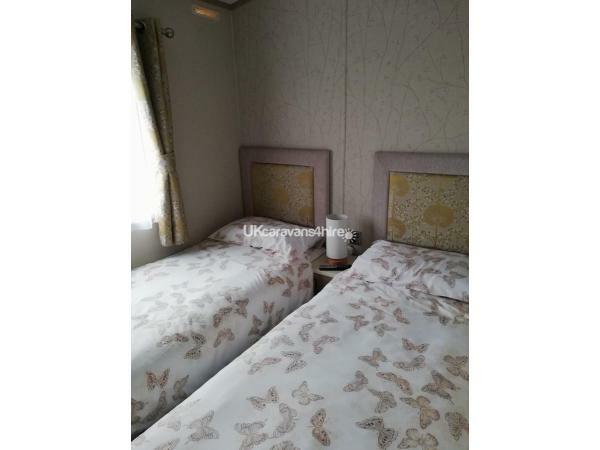 THE CARAVAN WAS PERFECT, IT WAS SPOTLESS AND EVERYTHING LOOKED BRAND NEW. IT WAS A TRUE HOME FROM HOME, EVERYTHING WE NEEDED WAS ON HAND. THE CARAVAN IS SITUATED IN A LOVELY PART OF THE SITE AND THE BEACH IS IN WALKING DISTANCE. ALL IN ALL A WONDERFUL HOLIDAY I WOULD DEFINATELY RECOMMEND. Glad you enjoyed your holiday at Greenacres.Thank you for your lovely comments on my caravan, and thank you for taking the time to send in a review it is very much appreciated. Stunning caravan. So clean and looked after with beautiful touches. As a family with small children the verander was perfect to keep our children safe and from any harm, all safe furniture and railings enabling us to relax rather than being on edge all the time (2x clumsy boys) Beds are so comfy, we all slept so well! Absolutely loved staying in this caravan so much so we will be back next year! Highly recommended. Thanks Angie! Thankyou for your lovely comments. I am so pleased you all enjoyed your stay. I look forward to you visiting our van again next season. 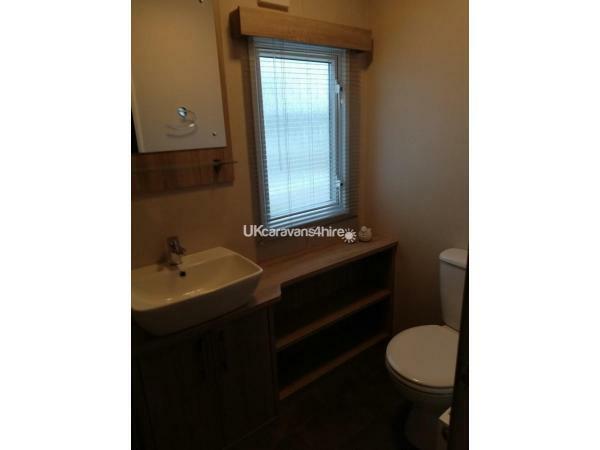 Beautiful caravan, very homely, spotless in every way. Caravan site great fun, plenty to do for families. Angela the owner very helpful , and we had a lovely message when we arrived home saying "hope we had a lovely time". So much so we are going to book again next year. Thankyou for your lovely comments. I look forward to you and your family visiting our caravan for another holiday.